Jacob Andris and his family has lived in two households. When Jacob’s father was still alive, the family lived in a small one-story home. In the present day, Jacob, his mother Mariana, and his stepfather Mike live in a two story house that’s slightly nicer than the one before. After remarrying, Mariana opted to move into a house with her new husband so they could sort of start fresh. After years on just her income, it was a welcome change to move into a nicer home where new memories could be made. Want to read more about Jacob Andris? Find his story on Lulu or Amazon! Ahhhhhhhhh my copy of @neonthewrite’s book just arrived! It has such a gorgeous cover and I can’t believe it’s so big! You don’t realize how long something is when you just read it online. I’m amazed! Light peeked under the hat. Bowman’s eyes widened as the side slowly lifted, and he pondered diving underneath to escape. A huge hand snaked its way under the brim and his nerves shattered. Fingers the size of his body fished in the dirt, looking for him. Bowman tried to evade them, but soon enough one of the giant fingertips brushed his arm. A fearful squeak formed in his throat as he tried to sidle around the hand only for a giant finger and thumb to pinch the front of his shirt. He twisted away, but that grasp dragged him forward several irresistible steps before the whole hand lunged forward and clamped around him. The skin was much thicker than his, to say nothing about the strength of the grip coiled around him. Air fled Bowman’s lungs and the hand dragged him out of his prison at last. It engulfed his body from the waist down, with one arm pinned to his side. Bowman felt the human’s slow pulse, heavy and powerful compared to his own, and heat radiated all around him. He squirmed with every ounce of strength he had, and his wings twitched with him. He pushed as hard as he could on the giant’s thumb as it lifted him up. The huge face loomed close, and Bowman did what he could to ignore it. By the time the giant was back at its full height, panic had settled around Bowman’s heart like a cage. The giant stared awkwardly at him, and he trembled every time he glanced up at those enormous brown eyes. His attempts to escape didn’t bother his captor at all. With no other options, Bowman let a desperate impulse drive his actions. He leaned forward and sank his teeth into the giant’s finger. The thick skin resisted his effort at first, and then his sharpest teeth broke through just enough. A faint taste of copper came just before the giant dropped him. He fell like a stone, taking a deep breath with newly freed lungs. Then, his wings snapped open and he leveled off in the air. He hurtled towards the edge of the clearing with his wings blurring in the night air to bank upwards. 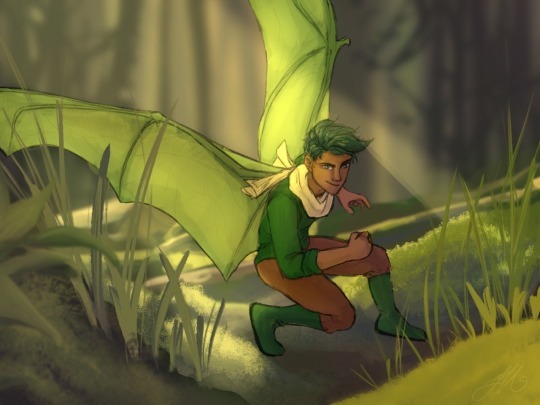 No giant would catch Bowman Leafwing when he was flying. With Bowman of Wellwood finally being published, It’s a good time to give a synopsis of the story for anyone who might not know what it actually is (I doubt I have any followers haven’t seen at least a glimpse or a mention of Bowman, but I could be mistaken). 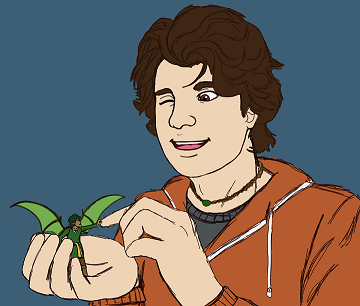 Bowman Leafwing is always flying himself right into trouble. In an idyllic forest haven, a young wood sprite must make his own adventures, and Bowman does so by sneaking out at night to fly in the dark. After a race with his friends is interrupted by an owl, Bowman makes a discovery that the village of Wellwood hasn’t seen in generations. Giant beings right out of the legends have moved into the forest, and though Bowman was once proud of his lofty four inch height, these newcomers tower over even him. Curiosity and miscommunication land Bowman in trouble, and he is left wondering: are these “humans” enemies, or are they allies? Bowman Leafwing is a four-inch-tall wood sprite, a species I have designed based on several different forest fairy (and general fae) legends. Wellwood is the name of the forest he calls home, with a village at its center housing a whole community of sprites. They are a pacifist group, though they are willing to defend themselves from predators. Enter Jacob Andris, a human camper who stands quite tall among his peers at six feet (and he’s not even fully grown yet). When Jacob discovers Bowman snooping around his campsite, he’s too fascinated. Somehow, he will have to work past a very rude (and grabby) first impression to earn back Bowman’s trust, in time for a much bigger threat than a fascinated camper to come to the forest.